My camera does not like sunlight. Did I accomplish anything today??? No matter how many days I spend in my room, I am starting to think I am always two days away from being ready. Note to self: switch posters on left and right sides of board. A little bit less cluttered than yesterday but still more stuff to find a home for. I adjusted the furniture slightly and added a few baskets. 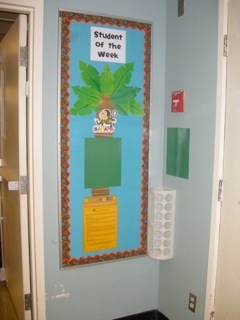 I moved my "Student of the Week" board into the hallway. Bananas and "All About Me" template still to be added.